EXCLUSIVE: This engineering masterpiece gets some well deserved world wide exposure - they say a picture is worth a thousand words...enjoy ;-) After an extended break Hooligan Underground returns with an early Christmas gift: 10 page color feature spread of the Ultimate Yamaha Factory Concept Bike .............................................................................................................. The publication is based in Finland and features the best customs on the planet: Visit the World Wide Bomber SITE Click on any image for XL size viewing!! 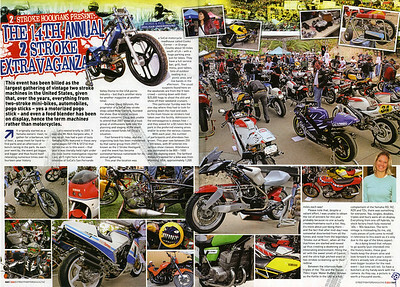 Exclusive coverage of the 2-Stroke Hooligans 14th Annual 2-Stroke Extravanganza!! Once again Hooligan Underground delivers the goods and Streetfighters magazine (UK) carries the 2 page full color feature. STREETFIGHTERS MAG (UK) is the Worlds Premier Ultimate Extreme M/C Publication "A Maverick Cult on the Fringes of Respectable Motorcycling" Click on any image for XL size viewing!! 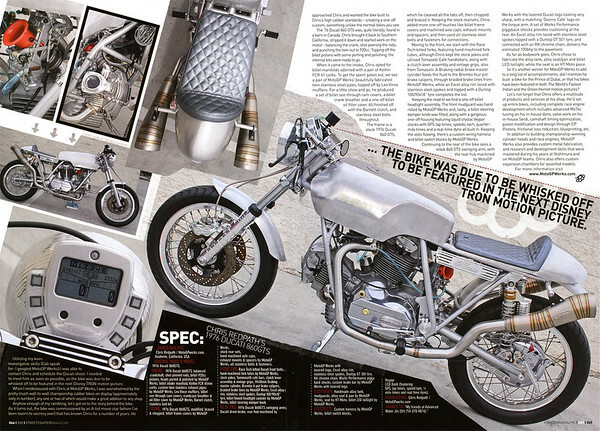 Exclusive Premier: Chris Redpath / MotoGP Werks Ultra-trick 1976 Ducati 860GTS featured in a 4-page full color spread in Streetfighters (UK) Magazine. Visit the MotoGP Werks site Here's pages 3 & 4... Click on the image for XL size viewing!! STREETFIGHTERS MAG (UK) is the Worlds Premier Ultimate Extreme M/C Publication "A Maverick Culton the Fringes of Respectable Motorcycling"
Yet another Exclusive World Premier: Dave Garrisons Ultra-sweet GC/GSXR 1000 Featured in Streetfighters (UK) Magazine. Pages 3-4 of this exclusive spread - once again HooliganUnderground.com beats all the other mags to the printing press! STREETFIGHTERS MAG (UK) is the Worlds Premier Ultimate Extreme M/C Publication "A Maverick Cult on the Fringes of Respectable Motorcycling" Click on any image to enlarge!! 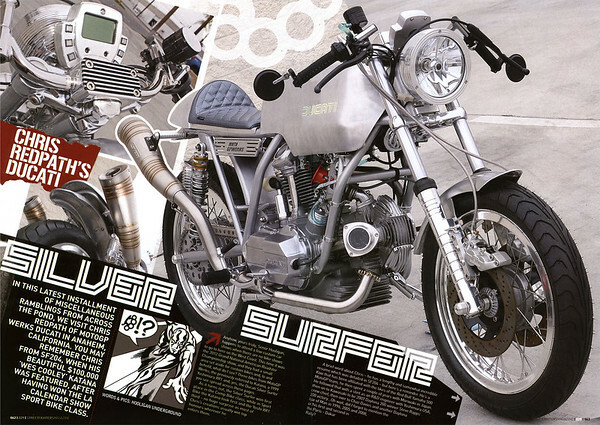 EXCLUSIVE: Dave Garrisons custom GC/GSXR 1000 that world premiered in SF is also featured in a 2 page full color spread in the final issue of Street Monsters (France) Magazine # 31. It was also an honor to have been featured in this fine magazine over the last couple of years. 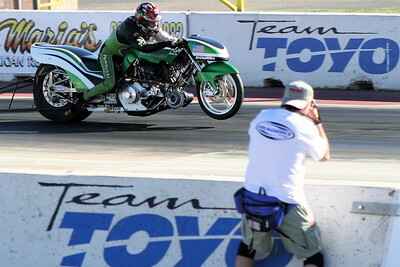 This marks Dave's second international premier for the GC/GSXR!! Click on any image for XL size viewing!! Exclusive World Premier: Mad Pitbull Designs Custom "Bio-Tech Beast" GSXR 1000 Featured in Streetfighters Magazine Issue # 217. Shot at the Lake Havasu XDL event before the powers that be shut down the shoot due to over the top hooliganism!! STREETFIGHTERS MAG (UK) is the Worlds Premier Ultimate Extreme M/C Publication "A Maverick Cult on the Fringes of Respectable Motorcycling" Click on any image to enlarge!! 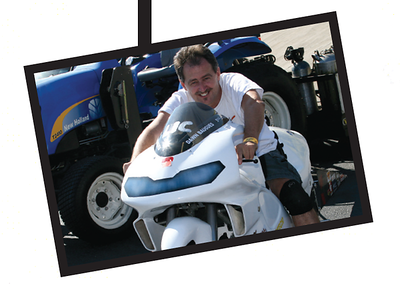 Yet another Exclusive World Premier: Dave Garrisons Ultra-sweet GC/GSXR 1000 Featured in Streetfighters (UK) Magazine. Pages 3-4 of this exclusive spread - once again HooliganUnderground.com beats all the other mags to the printing press! STREETFIGHTERS MAG (UK) is the Worlds Premier Ultimate Extreme M/C Publication "A Maverick Cult on the Fringes of Respectable Motorcycling"
Click on any image to enlarge! !